For the most part, gone are the days when a driver could switch back to paper logs for an indefinite period if the electronic logging technology failed. “The ELD mandate requires that we fix issues within eight days, so everyone has service-level agreements for seven or eight days,” said Cheryl Saxton, director of operations process development and technology solutions for Holland, a regional less-than-truckload carrier based in Holland, Mich.
For Holland, those resources come from Velociti, a company that installs and services aftermarket technologies used in the trucking industry. “We use Velociti both to install technology and to service it,” Saxton said. In her experience, one of the most common problems concerns cables and wiring, and fixing wiring issues can require some expertise. “If someone is doing a repair on something else and needs to disconnect wiring to the [engine control module] and then doesn’t plug it back in correctly, you’ll have a problem,” Saxton said. “Hardware failures don’t happen frequently, but they do occur,” she said, noting these devices are used heavily and undergo a lot of vibration and shock. In some cases, the challenge is simply detecting malfunctioning equipment in the first place. “When you buy new technology, ask the technology vendor what they recommend for detecting malfunctions,” said Jim Burg, president of James Burg Trucking Co., a truckload carrier based in Warren, Mich.
Velociti works to monitor onboard technology and detect problems as they occur, said Deryk Powell, the company’s president. The APIs make it possible to know details about a truck’s location and circumstances and help to reveal when systems are malfunctioning. “That allows us to quickly address any issues and work with the fleets to solve the problem,” Powell said. Cargo Transporters, a truckload carrier based in Claremont, N.C., installs all of its aftermarket onboard technology on its own, said John Pope, chairman. “The technology vendor usually sends someone to our site to help train a group of our people,” he said. The carrier has maintenance facilities at two locations and drivers come through one of these sites every five to seven days, Pope said. The task of determining whether a problem is hardware or software can be difficult, Pope said, because systems are becoming more complex. Sometimes, Cargo Transporters relies on tech support hotlines from the vendors and uses remote diagnostic troubleshooting tools. “If our technicians can’t determine the cause of a problem, sometimes the tech support experts can help us analyze the problem,” he said. Sometimes, drivers can be guided through repairs in the cab, said Mike Alexander, director of driver services at Paschall Truck Lines, a truckload carrier based in Murray, Ky.
“If there’s something like an incomplete download of an update that’s keeping the programs from working correctly, then the shop is going to try to troubleshoot the issue and talk the driver through certain repairs they can do in the cab, such as rebooting the system,” Alexander said. When a Paschall Truck Lines driver can’t fix the problem over the phone, the truck has to be taken to a vendor-qualified shop out on the road. Meanwhile, many technology vendors, such as telematics providers Omnitracs, PeopleNet, MiX Telematics and Verizon Connect, as well as in-cab video providers Lytx Inc. and SmartDrive, offer either nationwide networks of authorized service centers or mobile assistance to make repairs on site. PeopleNet offers “a comprehensive network of over 40 dedicated technicians strategically placed around the country with replacement parts in their possession,” said Tim Petersen, the company’s senior director of vehicle integration. PeopleNet’s repair costs are all inclusive, apply anywhere in the country and come with the guarantee of getting an ELD repair made within eight days. “Regardless of whether you are in a deeply rural location or in a city center, we are going to get there at the same time for the same price,” Petersen said. 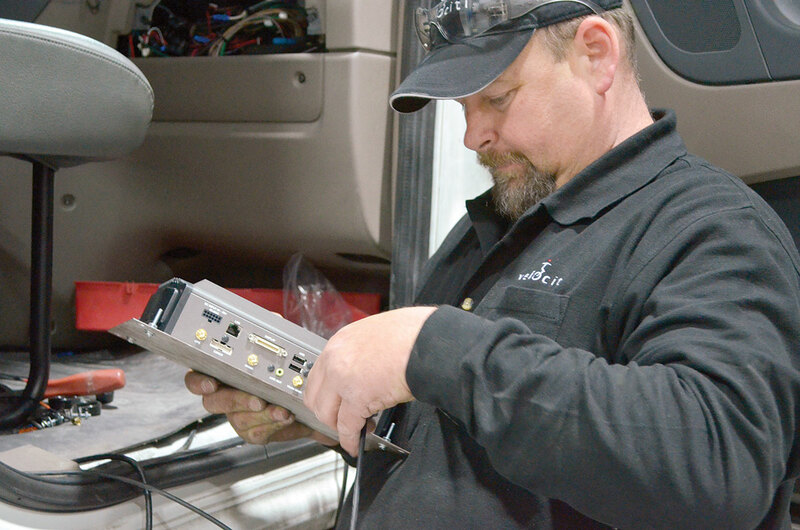 MiX Telematics uses a nationwide network of certified technicians who service hardware-related problems, said Pete Allen, chief client officer for MiX Telematics. The ELD mandate requires that we fix issues within eight days, so everyone has service-level agreements for seven or eight days. Omnitracs users can rely on a network of its authorized service centers, said Tom Neppl, the company’s vice president of hardware solutions. These are independent businesses that are trained, certified and supported by Omnitracs to provide installation and service to Omnitracs customers. “Each location has appropriate resources, tools and consigned inventory to ensure they can support all production Enterprise and XRS platforms,” Neppl said. Lytx services its hardware at its repair center in Houston, said Gary Johnson, director of risk and compliance management at the company. Lytx also works with Velociti to offer post-installation service contract options that provide proactive monitoring and repair to keep technologies online and working, he said. Verizon Connect helps customers ensure that in-cab hardware and software are maintained by providing “resources online, via phone and in-person,” said Erin Cave, vice president of product management. Verizon Connect is the new integrated brand for Verizon’s vehicle telematics division, which acquired Telogis and Fleetmatics in 2016. SmartDrive repairs are typically handled within five business days or sooner, said Jack Sadoway, director of field services for the company. Customers can choose between three field-service programs for getting equipment installed and serviced. The options include using a global network of certified SmartDrive authorized service partners, having fleet technicians trained and certified by SmartDrive and a turn-key program the company manages. Holland, meanwhile, partners with a technology expert for maintenance issues because doing so “leaves us free to focus on our operations and the things that we need to do internally,” Saxton said. But she also cautioned that fleets should not turn everything over to technology partners. “Maintain ownership of the technology and communicate carefully so that you work together efficiently,” she said. Velociti’s Powell noted that onboard technology adoption has exploded in recent years and the trend is poised to continue. “As a result, there is a tsunami of critical post-installation repair activity required that the industry must be prepared to address,” he said. ELD repair is a prime example, but he also stressed many carriers’ increasing reliance on onboard cameras.